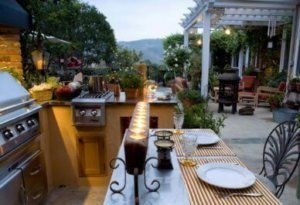 If you are thinking about hiring a professional contractor to remodel your backyard or outdoor living area, there are a few factors to consider before you dive into the project. For starters, we recommend that you consider size when doing any outdoor remodeling. Your outdoor living space should have a purpose and complement your home’s interior style. An outdoor living area should flow well for traffic patterns to other parts of your home, as well as for entertaining purposes. Pergolas are a highly decorative and affordable option for creating an outdoor oasis in your backyard. If you are considering a new pergola, it is important to ensure that it can withstand extreme weather and elements. A pergola should offer at least partial or open sunlight. Finally, because a pergola is open, it also allows you to enjoy the stars in the evening hours. While it does get hot in the Arizona desert, the addition of a fire feature can heat up your home’s outdoor décor. Many homeowners opt for fire pits professionally installed in their backyards. A growing trend is the addition of natural gas-fueled fire features that provide warmth and a stylistic enhancement. Another popular trend we have observed is the installation of decorative outdoor heaters. From customized propane or natural gas heating units to torches, there are numerous options that let you create an impressive outdoor living space. Canopy Beds Outside? Just Say Yes! When the sun drops behind the mountains, taking time to relax outdoors on a comfortable outdoor canopy bed or day bed is a nice way to enjoy your backyard oasis. Many homeowners in Arizona are incorporating canopy beds and day beds into their outdoor set-ups for the ultimate in relaxation. Outdoor remodeling provides style and function to your Arizona backyard. Are you ready to turn your outside space into a sophisticated, comfortable living environment? Call us today at (480) 428-2695 to learn more.